This is the front view of an 18" Union Mfg. 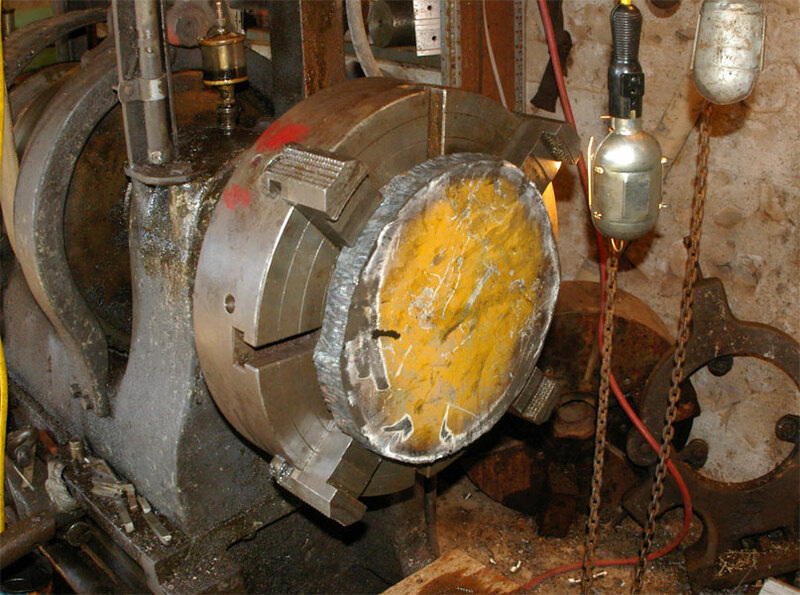 steel lathe chuck. It has one piece jaws which are reversible. This particular chuck has an L2 back. It is a good solid chuck which has served me well with the London Machine tool lathe for almost as long as we have had that lathe. These can be spendy new, but I scrounged it at an auction second hand where the value is pretty low. I'm not sure when it happened, but ultimately Union Mfg. became a division of Cushman Industries which seems to be the longest running 'name' in the workholding business in the US. You will also see the "Skinner" name around in older domestic chucks. Older lathes (World war I and before) mostly had thread mounts, in that the lathe spindle was threaded to some thread and diameter and the chuck screwed on. This had a disadvantage in that they are sometimes hard to unscrew and you must run the lathe backwards with care least you have the chuck unscrew. The "screw mount' is also cumbersome to change because you need to support the chuck while screwing it on which is difficult if you are hanging it from a chain fall as you need to with the heavier chucks. 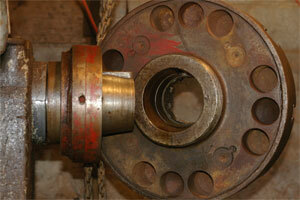 Consequently there was an effort to standardize the chuck mounts and make order out of choas in the 1930's. Instead of a different sized thread mount for every lathe at least 3 better ideas appeared. The so-called "American Long Taper Mount" was one of the three. The lathe spindle is tapered with a fairly steep taper several inches long and keyed. The chuck slips up on the taper and is held there by a draw nut and can't turn because of the keyway. There were a family of sizes of the L style from L0 (possibly L00) to include L1, L2 and L3). 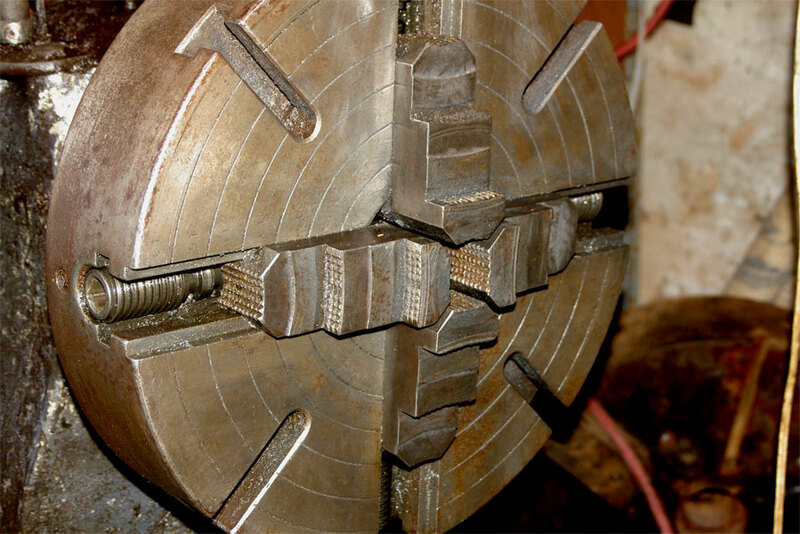 Although used extensively, the popularity of this style peaked in the World War II era (the heyday of engine lathes), and is unknown in the flood of imported lathes that began to dominate the market in the 1970's. 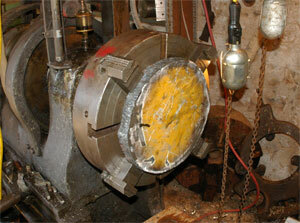 Thus when you see an L mount chuck or lathe you should think of the middle third of the 20th century. The second photo shows the advantage of a 4 jaw chuck in that you can grab irregular shapes--this being a part that was cut out with a torch. I will eventually bore out the center, grab the piece then by the center and turn the outside true making a ring out of it which will eventually become part of a chuck mount, but the principal remains the same---you can grab square and irregular shaped objects better with independently adjustable 4 jaws than you can with 3 jaws that all work together. The price is extra time to adjust each jaw. 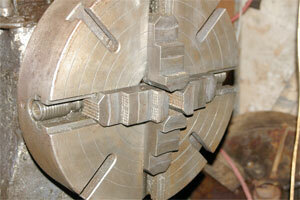 The 3rd photo shows the back side of this chuck. You can see the tapered spindle and the keyway and the giant nut that engages with the threads on the back of the chuck to hold it on the taper. Understand though that the spindle is not a factory spindle here, but a shop made adapter as the spindle of this lathe is a thread mount, and I simply made an adapter so I could use this chuck on a thread mount lathe.